Is it even possible for anyone to name a daughter Carol Anne anymore? It’s completely synonymous with the adorably creepy little girl in footsie pajamas who made contact with the ghosts occupying her house. 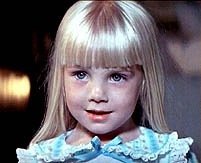 The actress, Heather O’Rourke, who played Carol Anne, died shortly after her 12th birthday which was believed to be part of the legendary Poltergeist curse. Nothing paranormal about her death though, diagnosed with Crohn’s disease, she had developed an acute bowel obstruction and later died in hospital of complications. During a scene when Robbie Freeling (Oliver Robins) was choked by a toy clown in his room, the mechanical prop malfunctioned and Robins was actually choked. Actor Will Sampson, a Creek Indian and shaman, performed an exorcism on the set of Poltergeist II to rid it of "alien spirits". A year after Poltergeist II was released, he died. During the fight Dominique Dunne had with her boyfriend that ended in her death, a friend inside Dunne’s house turned up the Poltergeist soundtrack to drown out the noise of the two yelling outside. This entry was posted on Thursday, November 1st, 2007 at 4:28 am	and is filed under Music, TV, Books And Movies. You can follow any responses to this entry through the RSS 2.0 feed. You can skip to the end and leave a response. Pinging is currently not allowed.